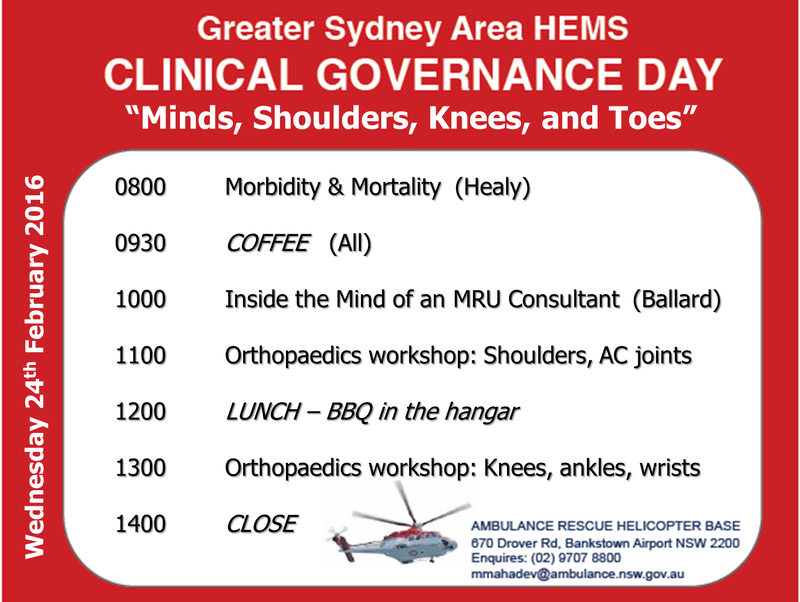 This is the first Clinical Governance Day of the term, and it is an excellent one. Welcome to our new registrars! A bit of Mortality & Morbidity (January) packed with learning points and always good for the soul! Ever wondered what’s going on inside the head of the person doing the tasking at MRU? Well now’s your chance to find out. We’ll hear from Neil Ballard, one of the MRU consultants about his perspective of tasking our missions and the challenges that entails. How would you deal with a dislocated shoulder in the prehospital environment? If you can’t reduce it then how will you package them for transport? What about lower limb injuries? Fracture dislocations? Sam Bendall and Dave McQuade are going to take us through some orthopaedic theory while keeping it as practical and hands on as possible. A special thank you goes out to Chris Partyka for his steadfast command of the Good Ship CGD over the last 6 months and his contribution to the transition to this term. We will aim to provide a BBQ lunch down at the hangar, please bring a small amount of cash to help cover that cost. We look forward to seeing as many of you as possible next Wednesday!